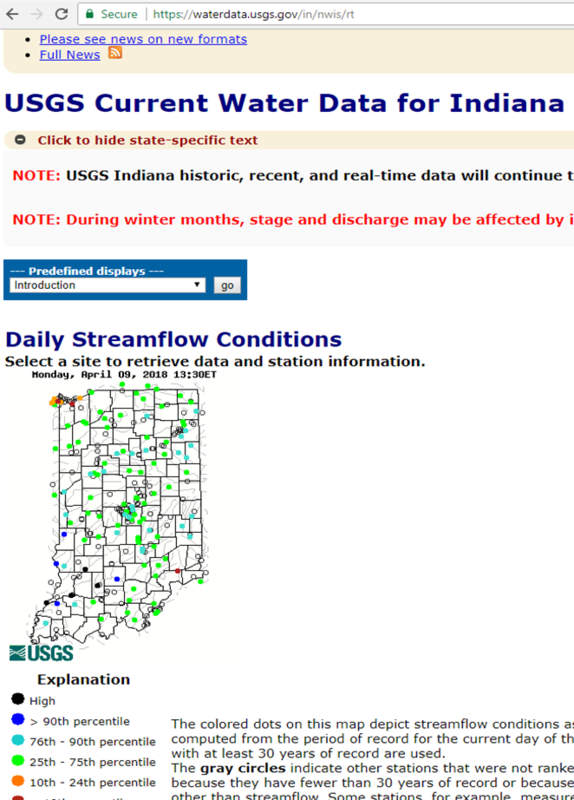 It is important to note that water levels and flow rates vary between waterways, and weather can be significantly different in the north portion of the 10 county NE Indiana Region than in the southern portion. Therefore it is imperative that before getting in your boat you check the water levels and flow of the waterway you intend to paddle, as well as the weather in the particular area of your paddle plan. When the tops of structures and rocks in the rivers are exposed out of the water, the current is often more predictable. The faster water will be found in the channel and conversely the slower water is confined to the areas behind or immediately downstream of rock structures. Conversely, higher river levels often will overtop dams and other structures and can result in much stronger eddy lines (a small whirlpool), boils and reverse hydraulics across areas of the river. Additionally, higher water levels can cover up snags, rocks, and other structures so that a paddler does not see them just under the surface of the water, which can easily cause a paddler to capsize. Paddlers are encouraged to become familiar with the effect of river levels on the section they intend to paddle. Every stretch of the river is different and water entering a main stem river from a tributary can greatly affect local river levels. There are a series of United States Geological Service gage stations located on waters of northeast Indiana. The gages are relative to the site they are located. For instance, when the Pigeon Creek gage station near Angola reports a water level of 10 feet, it does not mean the entire Pigeon River is 10 feet deep, but rather it is reporting simply the depth of the river at the location it is measured. However, the gages are useful to provide a paddler a general overview of the river and what to expect when planning a paddling trip. View current river conditions here. 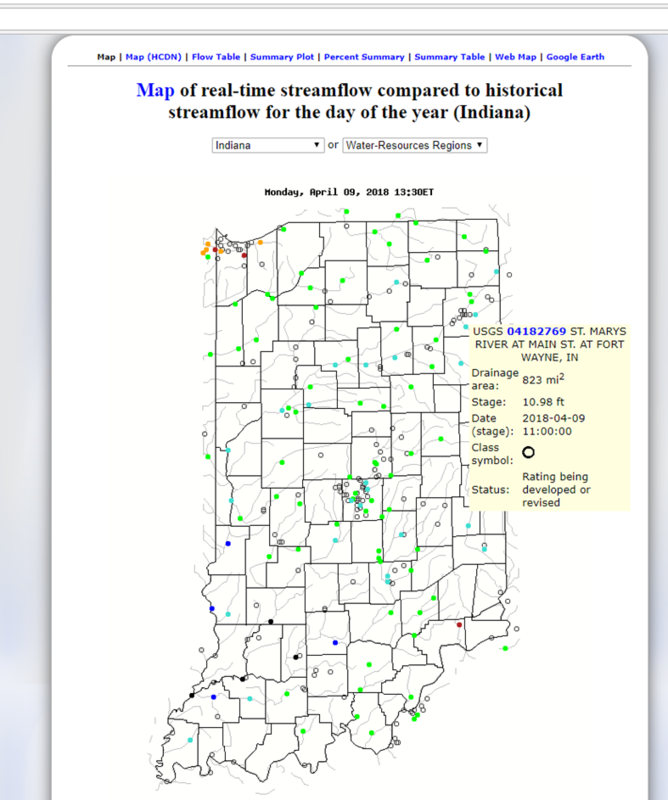 Every river in NE Indiana is different, where the Fawn River is typically only a few feet deep, the St. Marys River can be up to 10 feet deep in areas. However, when viewing the graphs you will find on the USGS site you will be able to discern what atypical or unsafe water levels or flow are by looking at the history. Below are some screen shots of the website to help you understand how to use this resource to determine if it is safe to paddle. 1. Click on a location that does not have a gage station (point) on it…click in white space…to enlarge the map. 2. Select the gage station (point) of interest. The yellow box will pop up and provide you with useful information, depending on what information is available for that site. Then click on the blue number associated with that gage station. 3. A page containing the available graphs will pop up. 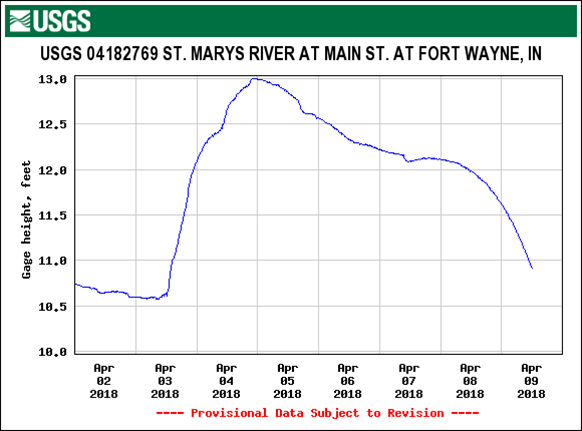 From this graph it can be determined that the river height is typically around 11 feet, but swelled likely after a rain event and is on its way back down to a typical river height. Remember, safety is key to having a great time on the Northeast Indiana Water Trails!